Any advice wuld be appreciated. BLG's are my favorites. I miss them popping up in my yard every season. 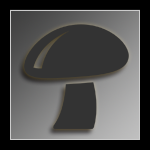 Badass tribe of the mushroom species. Edited by fungi2bwith, 11 November 2016 - 03:24 AM. My California friend TOLD me about these & said they didn't grow there. WHAT THE SEASON IS FOR LAUGHING GYMS. AND DO THEY STAIN BLUE???++PLEASE~anyone? and my son found WHAT i thought might be them-but he didn't notice where it was growing (TREE) OR other identifying factors. ANY GUIDANCE would EVER BE SO APPRECIATED. AS THEY "WON'T BE TOO STRONG FOR ME". AS I AM OLD & wanna visit NIRVANA every now & again. Edited by Amanita Versicula, 18 November 2016 - 09:21 AM.